When pharmaceutical companies take action to improve access to medicine, it has the largest impact on their own products. The Access to Medicine Index has identified which products those are – as well as future products still in development – for 20 of the world’s largest research-based pharmaceutical companies. From these companies, the Index identified products on the market and R&D projects for 77 high-burden diseases, conditions and pathogens. This includes diseases with the largest global impact on health, such as malaria and tuberculosis, and ones that overwhelmingly affect people living in low- and middle-income countries, such as river blindness (trachoma) and skin conditions caused by sandfly bites. How many products and projects are there? The Index identified 1,314 projects in development from the 20 companies. This includes everything sitting in preliminary and discovery stages of R&D, as well as potential products that are working their way through clinical trials. It also found 1,036 products for the diseases, conditions and pathogens in scope, mainly medicines and vaccines, as well as diagnostics. Which types of disease benefit most? Products for non-communicable diseases (NCDs) currently dominate the industry pipeline and portfolio. NCDs are also known as non-infectious diseases. These include chronic or 'lifestyle' diseases such as heart disease and diabetes. The chart above compares the size of the collective pipepline with the size of the collective portfolio, by type of disease. Collectively, the 20 companies have more products and R&D projects for NCDs, than for all other disease types examined. The incidence of NCDs is on the rise in low- and middle-income countries, driven by rapid urbanisation, worsening diets, and increasingly sedentary lifestyles. This has led experts to talk about the 'double burden of disease' in such countries: they still face high prevalence of infectious diseases such as malaria, but must now also grapple with the very different healthcare challenges posed by most NCDs, many of which require long-term treatment. Cancer accounts for the majority of R&D projects, while products for cardiovascular health and cancer make up large proportions of the collective portfolio. Cancer is newly in scope in the 2018 Access to Medicine Index. Detailed breakdown: which diseases are companies focusing on? Digging deeper into the data, the Index sized up the pipelines and portfolios for each of the 77 diseases, conditions and pathogens it examines. Cancer immediately stands out for having the largest R&D pipeline by far. Three diseases stand out for large portfolios: lower respiratory infections (such as pneumonia) and two types of heart disease. For some of the diseases, conditions and pathogens in scope, the Index only looks at what is in the pipeline. This is because these diseases have been flagged as priorities for R&D by the WHO and Policy Cures Research. There are either no products on the market for these diseases, or the products that are available are not suitable for people living in low- and middle-income countries. There are 22 diseases, conditions and pathogens that are only included in the Index R&D analysis. Although there are projects in the pipeline for the majority of these dieases, many are in early stages of development. Given the high failure rate of pharmaceutical R&D, this means there is a high chance that they will not reach the market. Which companies are driving product development? As well as breaking down the R&D activity by disease, the Index team has compared how many projects each company is developing. The result shows which companies are most likely to bring important new products to the market in the coming years. Which diseases have gained most new products since 2016? Cancer and diabetes account for more than half of all new market-approved indications. One new antibiotic, Pfizer’s ceftazidime/avibactam (Zavicefta®), is used to overcome antibiotic resistance in bacteria that have developed beta-lactamases. Merck & Co., Inc.’s bezlotoxumab (Zinplava™)is a monoclonal antibody that can be used to prevent recurrent Clostridium difficile infections in adult patients receiving traditional antibiotics such as oral vancomycin and metronidazole. GSK has four paediatric products for HIV/AIDS and lower respiratory infections. Johnson & Johnson contributes one with its chewable mebendazole (Vermox® Chewable) tablet for roundworms and whipworms. Merck & Co., Inc. contributes one approval, raltegravir (Isentress®) for the treatment of HIV/AIDS in newborns weighing at least two kilograms. Eisai’s perampanel (Fycompa®) is a monotherapy used for epileptic patients 12 years of age and older. Which companies have the most products already available? The Index has also broken down the portfolio by company, to compare how many products each company has under its influence. Five companies have markedly larger portfolios than the others: Novartis, Roche, Sanofi, Pfizer and GSK. All of these, apart from Roche, have large numbers of medicines and vaccines that the WHO has identified as essential for all healthcare systems (the WHO includes these products on its WHO Model List of Essential Medicines, or EML). All of the companies in the 2018 Index have at least some products on the EML. Overall, 60% of the medicines and vaccines in the portfolio are on the EML. 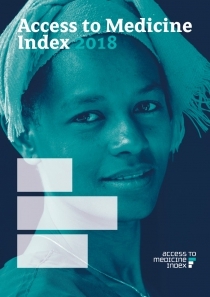 The Index examines company efforts to increase access to cancer products for the first time this year, focusing on cancer medicines deemed to be essential for all healthcare systems by WHO.